At the risk of starting World War III, here is the writer's opinion on where in north and south America, are the 10 best places to retire. This is not a money is no object list... this is a list of places some of the US some outside where you can live on a modest pension. Living overseas is by far the cheapest option... primarily due to lower health care costs... but leaving the confines of the US may not be for everyone... but as you can tell in the mission statement on the left the objective of this site is to get people to think of ways to retire that they may have not considered... if the desire to retire a strong enough, you can find a place do so. All of the locations are in North or South America, as Americans or Canadians, we may want to be able to get quickly back to our home countries for family emergencies, such as elderly parents. With the exception of Uruguay and Ecuador, the writer has personally visited each of these locations or experienced extensively the lifestyle suggested. Number one Arizona...it is where I live now and I'm certainly not going to admit that I live in a place that I don't enjoy... I was not born here but I got here as fast as I could...our home since 2004. 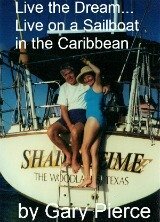 Number two Living aboard a sailboat in the Caribbean...the most fun you can have with your clothes on IMHO... we lived the life Jimmy Buffett sings about for eight wonderful years. Want to learn how to do it? Number three Living full-time in an RV...despite soaring fuel costs, this lifestyle gives you a location flexibility like no other. Number four Mexico...the country closest to the US, stay away from the border towns and you step back to a lifestyle like the US in the 1950s. Number five Ecuador...according to International Living Magazine, this is the number one overseas retirement destination for the last two years, the US dollar is the currency. Number six Florida...the best beaches in the US, for the water lover who does not mind humidity, hurricanes and bugs this would be my second choice of where to live in the US. Number seven Uruguay...the closest you can get to Europe without the European prices, a small country of less than 5 million, it is off the retirement radar for most, maybe you should take a look. Number eight Costa Rica...a beautiful Central American country, with the highest literacy rate in the Americas, by law no army, lush (lots of rain) big on eco-tourism. Number nine Panama...they actively solicit retirees from the US and Canada with a long list of benefits, due to the Canal zone, the locals are used to being around Americans. Number ten Belize...for water enthusiasts, the second-largest coral reef in the world, the language is English... formerly British Honduras. Why make a list of the 10 best places to retire? I certainly do not need the emails I will receive by omitting your favorite place to retire... but it is offered in the sense of getting people to think about retirement alternatives. Too many people, primarily due to the economy, have given up or postponed their plans for retirement... and that is a shame in my opinion, maybe just maybe, this list will get your creative juices flowing and think about lifestyles or locations that you have not previously considered. I hope you enjoyed reading the 10 best places to retire, I enjoyed making the list based upon my working on this site since 2009.
International Living Magazine get the most up to date information on living overseas...I subscibe.